"This dessert is easy to make, and the layers of chocolate and vanilla are beautiful." In separate bowls, prepare each pudding mix, using only one cup of milk per box. Let stand for about 5 minutes until slightly firm, then fold 1/2 of the whipped topping into each one. Place a layer of graham crackers in the bottom of an 8x8 inch pan. 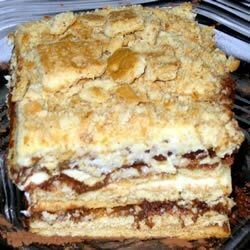 Spread half of the chocolate pudding over them, then layer more graham crackers over the top. Spread half of the vanilla pudding over the crackers, then cover with more crackers. Repeat, alternating the chocolate and vanilla. Chill at least 6 hours or overnight. This will cause the graham crackers to fluff up and taste like cake. Melt chocolate chips over a double boiler or in the microwave oven, then drizzle over the top. Cut into squares and serve. This receipe did not turn out well for me! The pudding part was good, the rest tasted like soggy graham crackers, not like cake. made this last weekend - it was yummy!! Next time I might try using vanilla wafers instead of graham crackers - could also use any flavor pudding for a change. Definitely a keeper!! When I make this, I use all vanilla pudding and I frost the top with chocolate frosting instead of the melted chocolate chips. Delicious and easy! Very Yummy. I agree, chocolate chips were not necessary and they didn't melt very well in the microwave anyway. My Dad said this was just like the ice box cakes from the 50's!!!! I made this in a lovely glass serving bowl, and everyone loved it! This recipe is a keeper!